The Bread Baking Babes are baking Vienna Bread and Kaiser Rolls in August 2011. 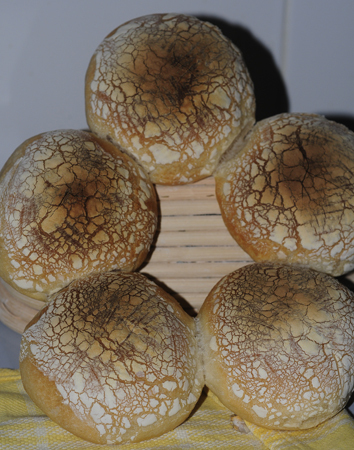 We love Kaiser Rolls and especially the ones with Dutch Crust or as the Dutch say; ‘Tijgerbolletjes’. Lovely rolls with a crusty crust and they look great. Many memories come when we have these on the table. Because the last time we ate them was more than five years ago in the Netherlands. Peter loved to eat them with corned beef and I loved them with fresh strawberries, but home made peanut butter is always good. I tried the Vienna rolls as shown by Astrid of Paulchen’s Blog, host for this months BBB. But as much as I tried, I couldn’t shape them into Kaisers rolls. Eventually they looked funny, but not like Kaisers rolls. So I went for Dutch Crust. Finally I could bake ‘Tijgerbroodjes’. I baked them two times, and I already know there will be more times. The first batch tasted delicious. A nice roll with a bit of crusty crust and a very nice soft crumb. But, I wasn't happy with the crusty crust and had to make them again. The crust became softer after the rolls cooled down. At first I had no idea what caused this. And then it came to me. We are in the middle of the rainy season and the humidity is very high. Soon after the rolls cooled enough the humidity found the rolls too. The second batch was much better. The same delicious crumb and this time also good looking and crusty rolls. We ate them while they just cooled enough; great crust! Even though the weather is causing softer crust, I keep on baking. Today I even baked a Tartine for my discovery of ..... Soon I will post my experiences. I've baked some different Tartines already. This time I used my ceramic pan for the first time and what a beautiful bread came out! In a bowl stir together salt, yeast and flour. Add 3/4 water mix on low speed with paddle until the ingredients comes together. The dough shouldn’t be sticky, but tacky is ok.
Knead the dough in the mixer until it is soft and tacky. Place it in a lightly oiled bowl, cover with plastic and lave it to ferment. It will not double, but grow 1 1/2 times in size in about 1 hour. Leave the dough in the bowl and gently degas it, cover it and place the bowl in the refrigerator for the night. These Exploding Tigers are from my first batch. They look ok, but bursted open trough the Dutch Crust. I think because of too much heat. It's difficult to adjust the temperature in my oven. 1 hour before starting to make the bread: remove pâte fermentée from fridge. Cut into 10 pieces. Cover with a towel or plastic wrap. Add flour, sugar, salt and yeast into the mixing bowl. Add pâte fermentée pieces, egg, butter and 75% of water. Stir together until you have a nice ball. Add a little more water to get soft dough. Knead for about 10 minutes on floured counter or in your machine with dough hook on medium speed for 6 minutes. Add flour if needed to achieve a firm but elastic dough (tacky not sticky). Take a piece of dough and gently stretch the center until you can almost see trough it and the dough doesn’t tear. When it tears you need more time to knead. Transfer the dough to lightly oiled bowl. Cover with plastic wrap. Ferment at room temp for 2 hours or until doubled in size. When the dough doubled in size, punch it down and return it to bowl until the dough doubles again. Transfer the dough to the work counter and divide into 10 equal pieces for rolls. Pre shape into balls. Cover and leave to rest. At this time you prepare the mixture for the Dutch Crunch. Mix: 1 tablespoon flour, 110 grams rice flour, ¾ teaspoon instant yeast, 2 teaspoon sugar, ¼ teaspoon salt, 2 tablespoon oil and 6-8 tablespoon water. It should be thin enough to spread on top of the rolls and stay there. This picture is of the first batch, the second was a bit thinner a and cracked more. Leave the rolls to dry and cover them to proof at room temp 60-90 minutes or until they have risen to approx. 1 3/4 of their original size. Preheat your oven to 230˚C and place a steam pan filled with stones in your oven. Place the rolls with parchment paper on the baking stone. Pour 236 grams of boiling water into your steam pan and quickly close the oven door. Leave the rolls to bake with steam for 10 minutes. Take out the baking pan and rotate breads 180° for even baking. Turn the oven down to 200˚C and bake until the rolls are golden brown. It was delicious; a exploding tiger bun with avocado and chicken salad. Let the rolls cool on wire rack. Your tiger rolls look wonderful. And even though it wasn't intended, I love the look of the exploding Tigers. The crackling surface of these rolls looks amazing. Would be just delicious to bite in to!